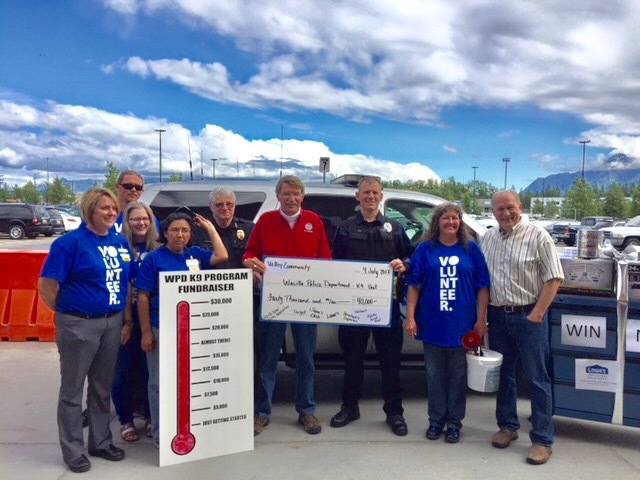 July 12, 2017 JUNEAU —As a part of continuing work to build a Safer Alaska, Governor Bill Walker on Sunday donated $11,000 of his salary to support the Wasilla Police Department’s fundraiser for a new drug detection K9. In April, the department’s only drug detection K9, Marshal, was euthanized after a veterinarian found inoperable, cancerous masses in his abdomen. In his January State of the State Address, Governor Walker announced his intention to lead by example during difficult fiscal times by taking a one-third salary reduction, and submitted legislation (House Bill 71 and Senate Bill 31) to allow him to do so. Neither bill was acted upon; as a result, Governor Walker will donate one-third of his salary to support important community initiatives that are likely to result in cost savings to the State. The $11,000 donation to the Wasilla Police Department is the first quarter of those donations. Drug detection K9s have played an important role in the state’s opioid epidemic response. They assist investigators in locating and confiscating opioids and other banned substances, preventing their distribution and consumption, and saving the state potentially thousands of dollars in response costs. M.O.C.H.A., one of the Alaska State Troopers’ newest K9s, is already responsible for the seizure of over $42,000 in drug-related cash, and over 4,300 grams of banned substances.